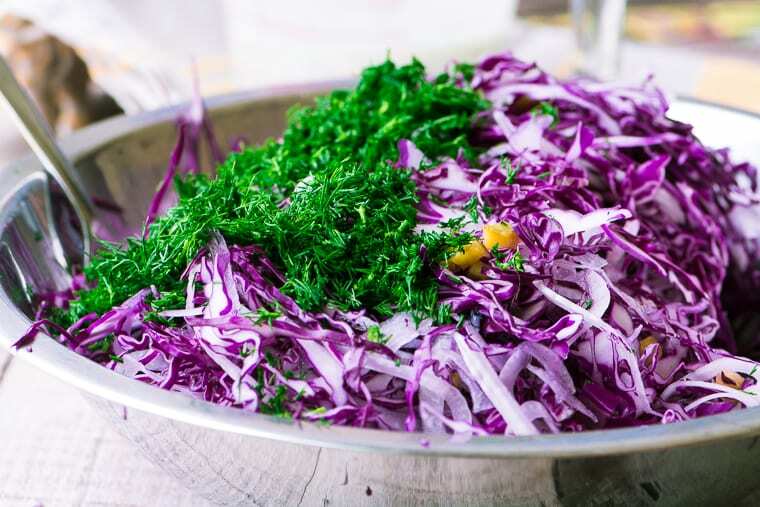 Red Cabbage and Dill Slaw ~ this colorful coleslaw will be your go-to side dish this summer, it goes with anything and everything…I say skip the deli counter and make your own, it’s easy, healthier, and costs just pennies per serving! I can feel it, this red cabbage cole slaw recipe is the beginning of a slaw binge. I don’t know how many of them will wind up on the blog, I don’t want to drown you in slaw, but for me, I’m craving the stuff, and the cool peppery crunch just feels right with everything these days. Every cuisine has a version of slaw, and that’s because cabbages are the workhorses of the food world ~ they’re healthy, sturdy, and cheap. This one had roots in Pennsylvania Dutch country, where slaw is serious business. 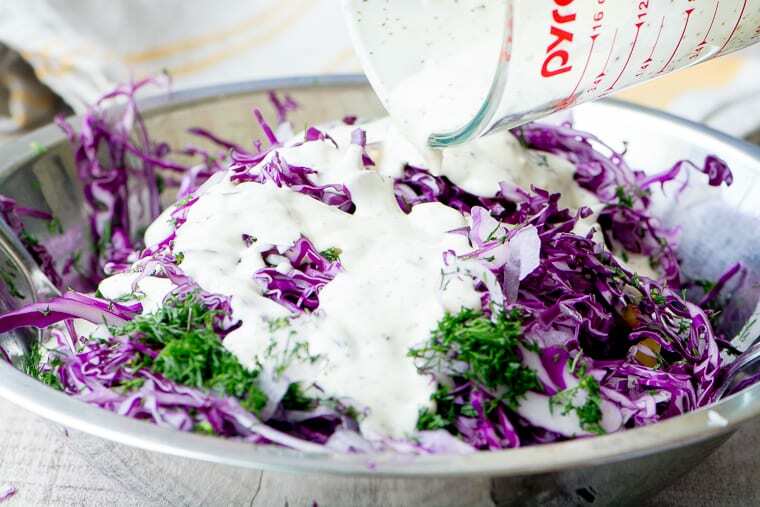 A creamy buttermilk dressing, an entire bunch of fresh dill, chopped pickles, and pickle juice make this red cabbage and dill slaw stand out from the rest. The best slaw is sliced, not shredded, at precisely 1/8″ ~ any thicker and it will be tough to eat, any thinner and it disintegrates into mush. Trust me on this. I use a mandoline slicer for slicing my cabbage. This will be the quickest method with least cleanup. You can control the exact thickness of your slices, which is important. For this salad I cut up a small head of cabbage, and about a half of a small sweet onion, I love Vidalias when I can find them. I add a whole bunch (literally, an entire bunch) of chopped fresh dill, and a couple of finely diced dill pickles. The buttermilk mayo dressing is thinned with pickle juice and a touch of vinegar. There are mustard and celery seeds in there as well. TIP: Don’t thin your dressing down too much, the cabbage will release moisture as it sits in the refrigerator, and will naturally thin out the dressing, so I like to start with a relatively thick mixture. 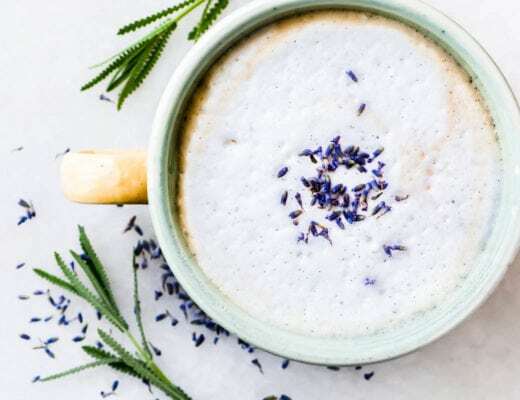 Red cabbage is so healthy, and that gorgeous purple color signifies so many nutritional benefits ~ it has more vitamin C than oranges, and tons of anti-oxidants. 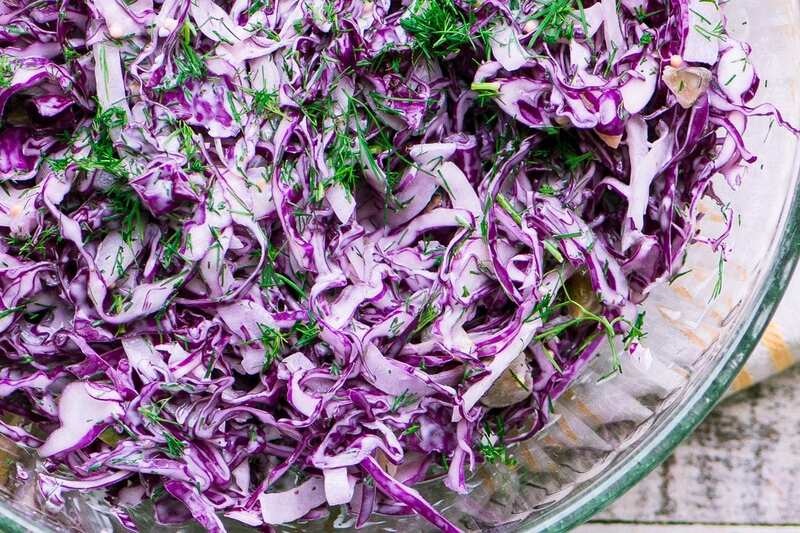 FOOD STYLING TIP: Save some fresh dill to scatter over the red cabbage cole slaw just before serving, the colors will really pop. 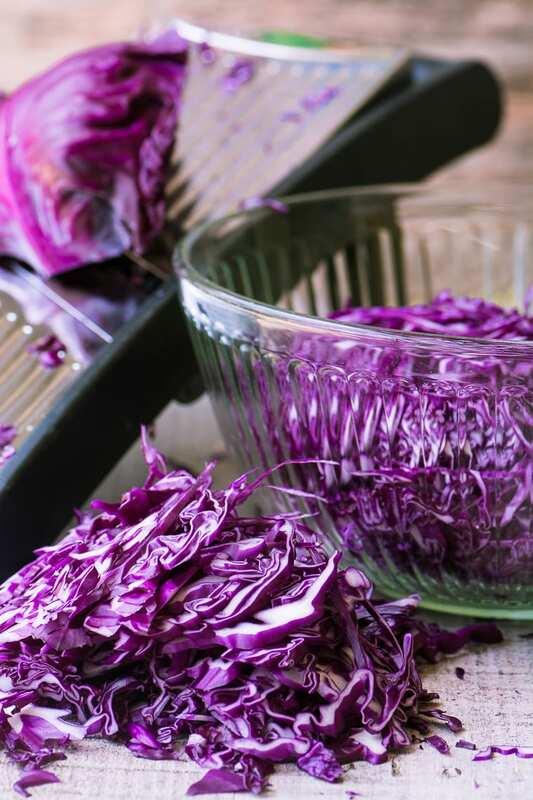 Make this red cabbage slaw your own! Make it vegan by substituting oil and vinegar for the mayo and buttermilk, try 3 parts oil to 1 part vinegar. Give it a kick ~ try a dab of horseradish or horseradish cream in the dressing. Add shredded carrots for extra color. Use gherkin pickles instead of dills. Sweeten it like the Amish do with a tablespoon of sugar in the dressing. Make it even healthier and reduce fat and calories by substituting Greek yogurt for the mayonnaise. This would make a pretty green slaw with regular, napa, or savoy cabbage. 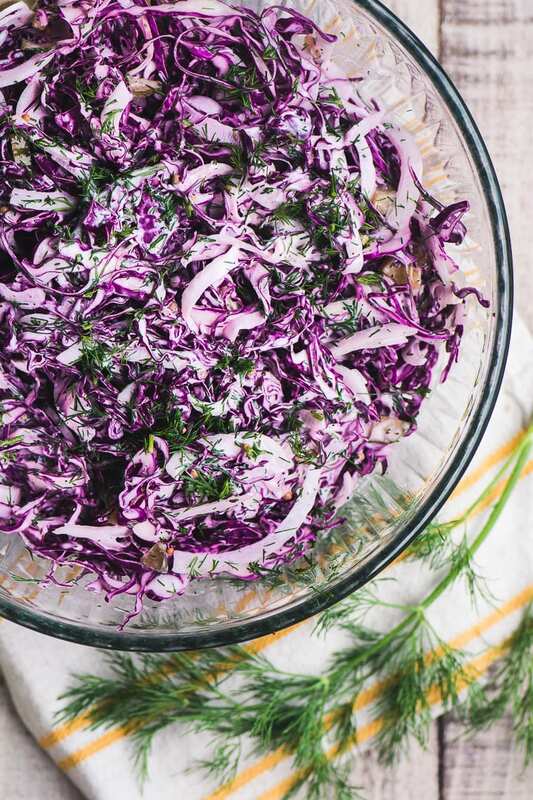 Red Cabbage and Dill Slaw ~ this colorful coleslaw will be your go-to side dish this summer, it goes with anything and everything...I say skip the deli counter and make your own, it's easy, healthier, and costs just pennies per serving! Cut the cabbage in half, and then into quarters. Slice away the white core. 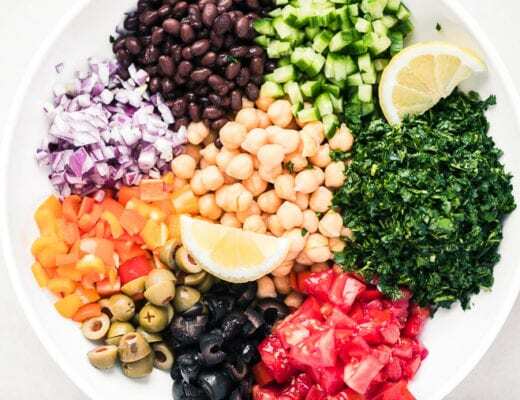 Cut the quarters into 1/8 inch slices, a mandoline slicer works well for this, Put the cabbage in your largest mixing bowl. Slice the onion into 1/8 inch slices, and cut the rounds in half. Separate the strands as you add them to the bowl. Add the chopped dill and pickles and toss well. Whisk together the dressing ingredients and give it a taste to adjust. Toss the slaw with enough dressing to thoroughly moisten, but don't drown it, you may have extra dressing. Cover well and refrigerate for at least an hour before serving. Just before serving toss again, add more dressing if necessary, and garnish with fresh dill. There's a sweet spot for serving slaw, and it's somewhere between 1 and 4 hours after it's been made. Any less time and the flavors won't have a change to sink in and tenderize the cabbage ~ any more time and it slowly starts to break down and loose crunch and color. That being said, the slaw will be perfectly fine the next day, I'm just being a perfectionist about it ;) Be sure to taste it before you serve it...you may want to add more salt, more vinegar, or more pepper, etc. Thanks for pinning this healthy and delicious Red Cabbage and Dill Slaw! What a unique version of coleslaw! The dill flavor really helped knock this recipe out of the park! Well done, thanks for sharing! This is the BEST!!! I will add this to one of my favorite recipes for sure! I love your recipes and all the ones I’ve tried are winners! The salsa recipe can be used in so many ways and everyone loves it–THANK YOU! I’m grinning from ear to ear Susan! Made this slaw last night to go with grilled salmon. It is a good looking dish but I found it lacking in flavor I added more apple cider vinegar and chopped pickles but something is missing. Maybe I just like a sweeter slaw dressing. Will try again with bread and butter pickles or maybe pineapple. The long shed didn’t go over so well, so I’ll go smaller next time. Hey Cheryl ~ thanks for your feedback. I tend to like my dressings on the simple side, flavor wise, but you can definitely intensify it with more vinegar. You can also try a bit of onion salt, or mustard powder. I love horseradish cream, too. And if you’re looking for that store-bought or ‘deli’ coleslaw flavor, they definitely sweeten theirs, so play around with a little sugar or brown sugar mixed in. Hope this helps! I’m not a fan if MW but I might try a sprinkle of sugar. I’m also considering a handful golden raisins. Since my leftovers are soft, the texture of raisins might not be as distracting as they would in the fresh-made slaw. The red/purple cabbage and bright green dill look so beautiful together! 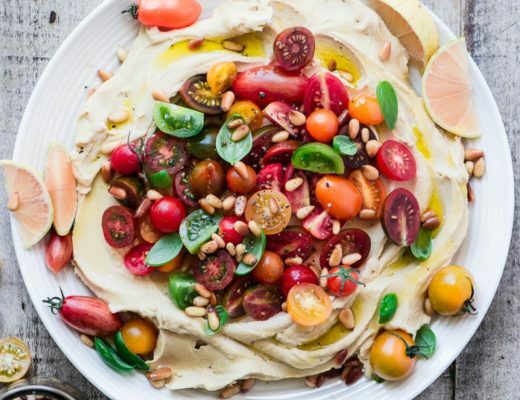 I love slaws of all kinds and they are a perfect side for so many summer entrees. Lovely! We eat a lot of slaw around here. Manservant prefers it over salad! Loving this version! I have never had pickles or dill in slaw before, but I am loving it. This is on my list to make. I love cole slaw, I could eat every day of the week. The red cabbage looks great!! I actually have a weird obsession with cole slaw… like, I can eat just a vat of it for a meal. :) Naturally I am LOVING this one!! It’s soooo gosh darn pretty! And I love that dill!! Can’t wait to try this! Cheers, friend! 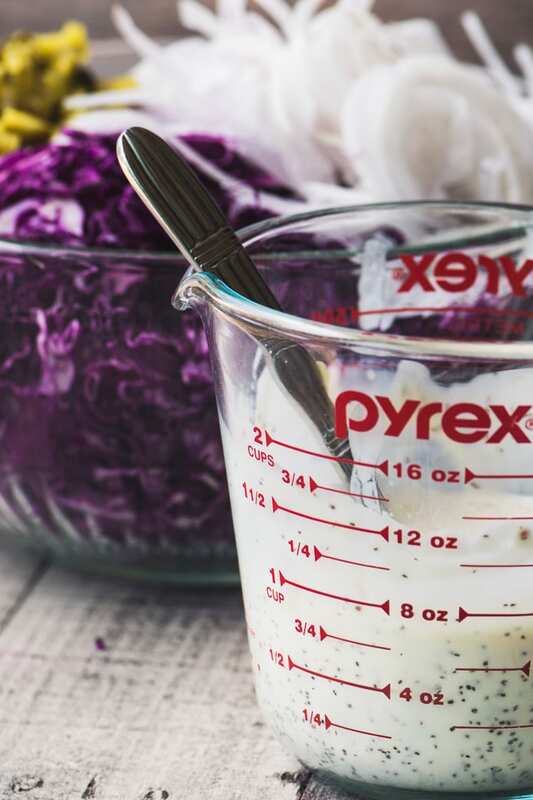 I really don’t think I have ever called a slaw recipe “pretty”, but this one certainly is, as a picture! Lovely and sounds so refreshing! I really like all the colours, it looks like spring, I’m trying it! This is what makes slaw great! Its fresh, its vibrant. You are right goes with almost everything. Definitely pleasing to the eye, Sue. I would even double the amount of dill, love fresh dill so much:). This coleslaw and a crab cake or some grilled fish make a dreamy dinner! How about a dill slaw, Milena, I know we can come up with a great one! This has to be the prettiest slaw out there Sue, I can see why you are craving this sweet crunchy veggie. I’m a big slaw fan. This one is really delicious- I love the dill and pickle flavors. And it’s very pretty on the plate! This is so pretty in addition to being a wonderful addition to my slaw recipe collection! I love the purple and green! I know, I’ve got a collection going, too, there are so many ways to spin this! This colorful version really sounds good with the dressing and pickles. Can’t wait to give it a try. I’ve got a bunch of dill growing in my garden! And itching to use it. :-) This is SO pretty — love the color. Thanks! Thanks John, how nice to have a garden full of dill! I love how inexpensive this is and with such beautiful color too! 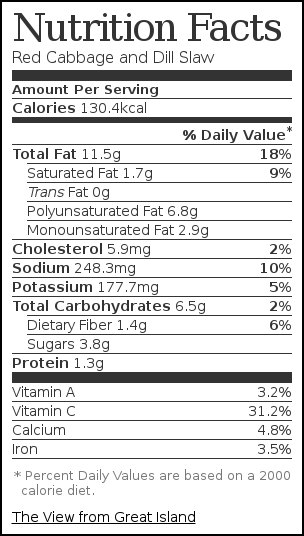 I can see this on sandwiches, along side BBQ – everything and anything. Great summer recipe! Isn’t it funny that the healthiest foods are often the cheapest!! No way I can find red cabbage in spring time…so save this for next season. It looks stunning! That’s strange Angie, because it’s a year round grocery staple here!